CHICAGO – Stadium, the first 24/7 multi-platform sports network, today announced a new interactive series exclusively on Twitch. 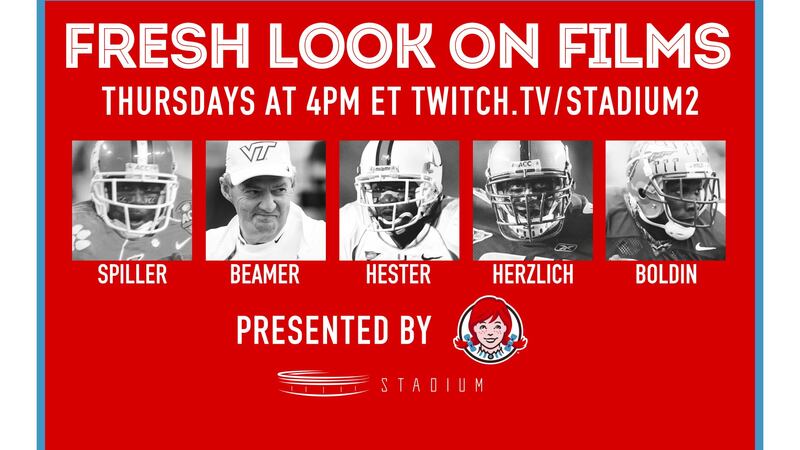 Partnering with Wendy’s®, Stadium will produce a five-part series that features college football players and coaches taking to Twitch to view and comment on a classic game they participated in. “Fresh Look on Films” will be hosted by Stadium’s own Michael Felder as football stars join him to relive the highs and lows from a classic game and break down the action live. The five-week series will feature former Clemson RB and first-round NFL draft choice, CJ Spiller, former Miami return specialist and first team All-American, Devin Hester, former Boston College All-American LB, Mark Herzlich, retired Virginia Tech Head Coach and College Football Hall of Fame member, Frank Beamer, and former Florida WR and Super Bowl Champion, Anquan Boldin. Beginning October 25, 2018 and every Thursday following at 4:00 p.m. ET, a new guest will share game highlights with fans. Stadium will use the interactive features of Twitch to test viewers’ knowledge of the game with trivia, offering fans the opportunity to win fresh, never frozen beef* hamburgers from Wendy’s for a year. ** Winners to receive a $500 Wendy’s gift card which is equal to two Dave’s Single® hamburgers per week for one year. Read entire sweepstakes rules here.